One of Frank Capra’s early, lesser known films is a revelation for fans of It’s a Wonderful Life and Mr. Deeds Goes to Town. Addressing some of the same themes Capra would tackle in these classic films, in his own inimitable style, he again focuses on American history and the character of the small town hero. Bank president Thomas Dickson (Walter Huston, The Treasure of the Sierra Madre) battles his board of directors in order to keep making loans to his hard-pressed clientele. When dire circumstances threaten the bank’s solvency, chief teller Matt Brown (Pat O’Brien, Some Like it Hot, Angels with Dirty Faces) and his fianc?e (Constance Cummings, Blithe Spirit) rally around the boss, but will it be too little too late? Newly remastered. 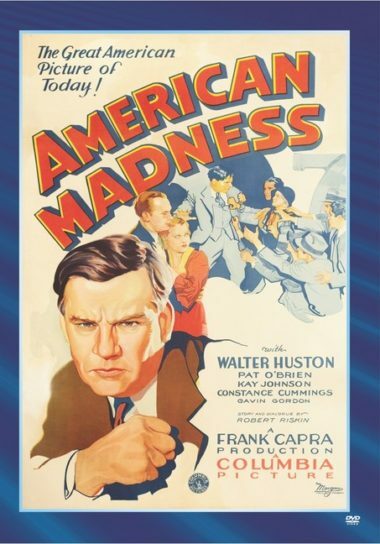 During the Depression, the bank owned by generous Dickson (Walter Huston) is barely staying afloat, and things get worse when $100,000 is lifted from the vault.